To her credit, Hood was the largest RN warship and a beautiful vessel that could be used to advertise the power of the Royal Navy, serve when required as a Royal Yacht, look magnificent as the Flag Ship. On the debit side, she was a wet ship, some saying that there were destroyers that were drier in any sort of weather. Most significantly, she proved unable to match the rate of fire and accuracy of the German battleship Bismarck and her thin sparingly applied armour was unable to protect her magazines from plunging fire, resulting in her loss with almost all hands. In fairness to the ship, the shock of her destruction was as much to do with unfounded belief in her invulnerability, and poor gun handling skills that may have resulted from her crew becoming accustomed to acting as a floating billboard for Britain and the Royal Navy, rather than as a working ship of war. SUBJECT: Royal Navy, naval architecture, steam turbines, turret guns, armoured warships, battlecruisers, capital ships, model engineering, model making, scale plans, WWII, World War Two, Second World War, Bismarck, Prince of Wales. DESCRIPTION: There are many reasons why a warship can become an icon. In the case of HMS Hood, it was for all the wrong reasons. The battlecruiser was an attempt to combine the power of the battleship with the speed and manoeuvrability of a heavy cruiser. That required several areas of compromise and produced a vessel that had vulnerabilities but offered little real advantage over the more rugged battleship. As a big-gun design it came at the point where the rule of the heavy naval gun was coming to an end in battles at sea, being replaced by the aircraft carrier. Credits and debits aside, Hood has achieved a level of fame that makes her an interesting and impressive model at any scale. She is also an important part of the final story of the big gun line of battle ship and of the Royal Navy of the between war years. Her destruction also provided lessons for naval history enthusiasts and naval professionals. She has a majesty that will appeal to many who rarely buy books on a warship theme, and at such an aggressive price, this is a very affordable book. The publishers have established a premier position with books of this format and the author has an equally distinguished reputation. The ‘Anatomy of the Ship’ series is now long established and sets a benchmark in its field. This new book fully lives up to the established reputation. Text is concise but more than adequate. The strength of this series and this particular book lies in the very high quality drawings and the excellent selection of photographs. The drawings are detailed and accurate, at declared scales. This series has helped in the production of fine display and working models, many to exhibition standard and in large scales. This book will help serious modellers to produce some outstanding and impressive models. The series standard layout has been followed. The first of over 300 of the finest drawings and plans begins with the folding front cover that has inside a 1:600 scale side view waterline drawing of Hood and a 1:600 side view cutaway drawing. The rare cover also folds out to display a full, from the keel, drawing of Hood, above a full length plan view. 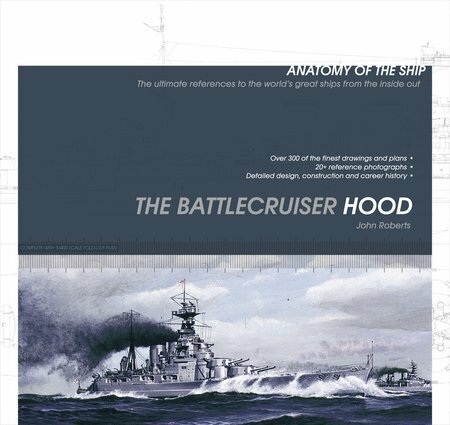 Inside, the introductory text provides all of the key details concisely and is followed by a photographic section that ends with one of the last images of Hood taken at Scapa Flow shortly before she steamed out to meet the Bismarck. The main body of the book is given to very fine technical drawings of the ship in every aspect. This includes all of the fine detail including capstans and anchors. The drawings come to a close with a set of drawings covering the ship’s boats in fine detail. The armament is covered from the 15in Mk I main armament down to the 3pdr saluting gun, and the fire control is detailed. Due to the level of detail in the immaculate drawings, those wishing to use the book as a source for model making and model engineering are given a choice of complete scale models, or sectional models. The ship’s boats are subjects in their own right, but a gun turret and loading system could be modelled at large scale and large scale models of sections of the ship and sections of the ship’s boats could be made. Historically, advanced modellers have manually constructed much of their model and then added some fine detail using parts made by moulding or etching or casting and produced by specialist suppliers. Some advanced modellers are now experimenting with 3D printing. Current equipment costs confine this new technology to the very serious, or professional, modeller, or model engineer, but costs as falling and the equipment is falling into a wider range of pockets. There is sufficient information in the fine drawings produced for this book to develop a set of 3D electronic drawings from which to power a 3D printer. For the model engineer, this is a very interesting new opportunity because the raw material used by 3Ds printers will support high temperatures and pressures. A handgun has already been designed and distributed over the Internet that can fire standard pistol cartridges and the only metal in the design is the firing pin, where a nail has been used to comply with a US requirement for handguns to include at least one metal component that would show up on security scanners. This means that those building large highly detailed working models would be able to use 3D printing to produce all components if necessary and that working blank-firing guns could be constructed. For those with the skills to work at this level, all guns could be built to realistically fire, either by using blank cartridges, or electrically-fired gas chambers.